That sister hadn't heard of Molly Ringwald is upsetting. I mean what the hell are they teaching in schools these days?! But more upsetting is a thought I had moments after reading K's post this morning. Think about it. The Breakfast Club is pretty much a movie that defined a generation. Not really, it's just a movie that people who were young at a certain time watched a lot. Right? I assumed that young people would always watch this movie. Right? Because it is awesome. In fact I wish I was watching it right now. But bra-fitting girlfriend hasn't heard of Molly Ringwald, suggesting she hasn't seen it. You see where I am going with this? I don't know, maybe it is because the review of the Red Dawn remake is fresh in my brain or maybe it is because I am still upset about last year's remake of Footloose. But you guys if the movie moguls get wind of the fact that kids aren't watching The Breakfast Club they may think it is a good idea to make a new one. You guys, I don't want John Hughes rolling over in his grave. 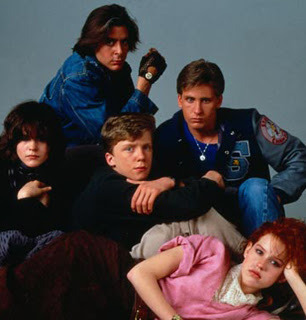 And even more I do not want to see a Breakfast Club remake.